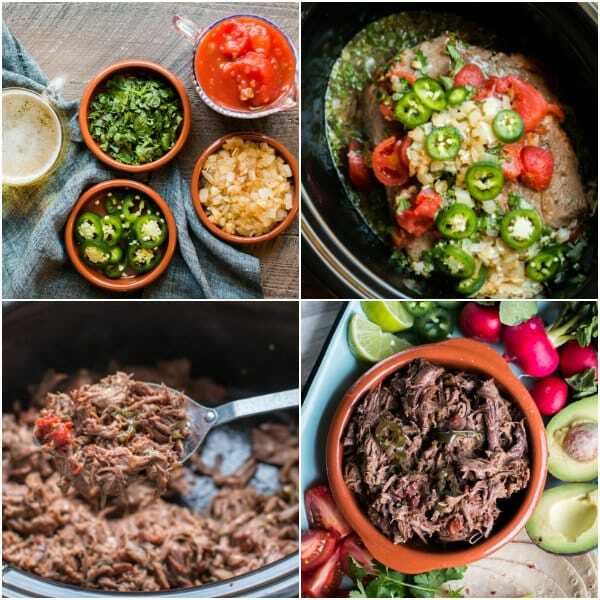 This Slow Cooker Mexican Shredded Beef is very versatile. Pile it on burritos, tacos, or even make enchiladas or tamales with it! 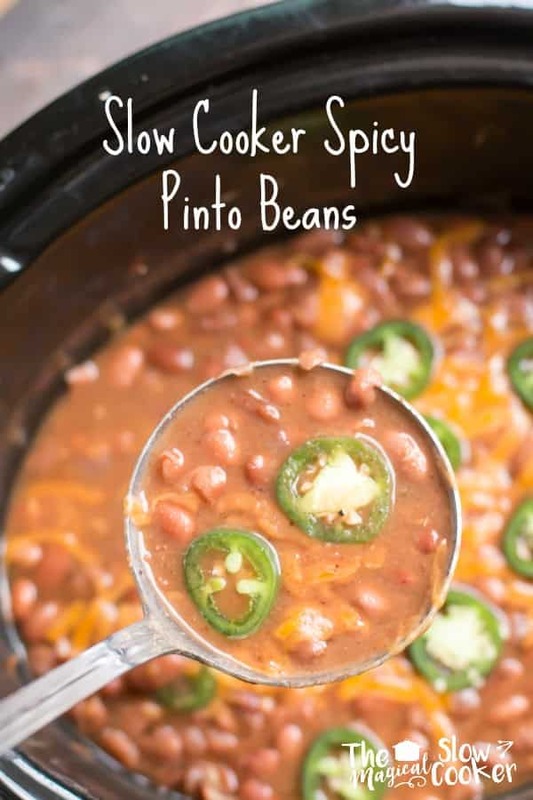 This is one of the first recipes I would make in the slow cooker years ago, though every time I’ve made it I seem to add a few things to the pot. 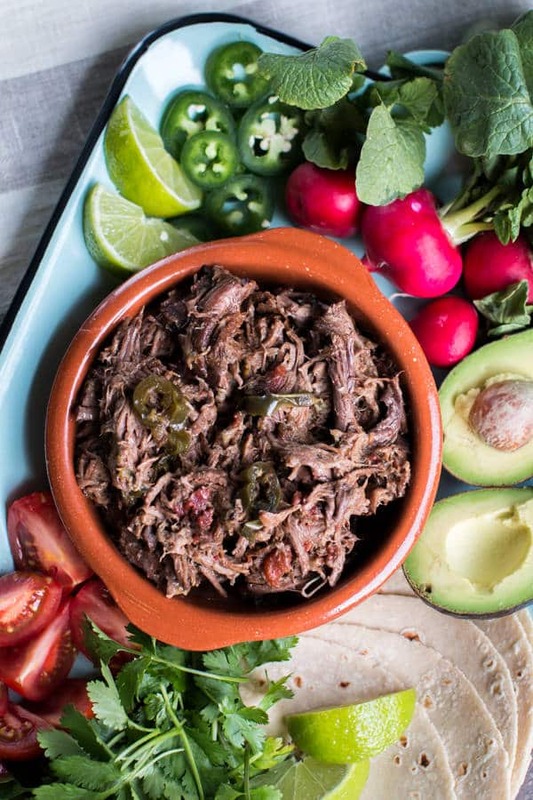 Shredded beef can be used in so many recipes, you can have something different with it for days! I start by browning a chuck roast and putting in the slow cooker. 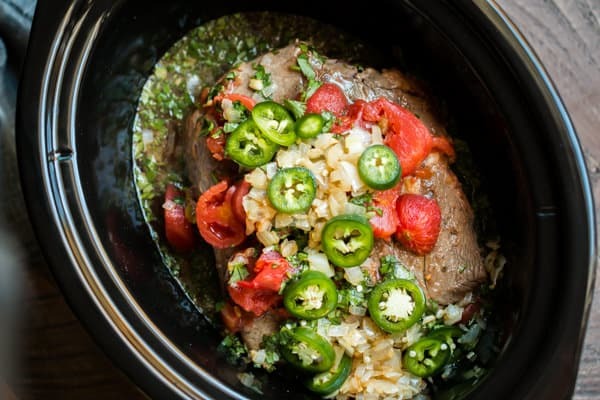 I add stewed tomatoes, beer, salt, pepper, cumin, cilantro, cooked onions and jalapeno. If you don’t cook with beer, a cup of water or beef broth will do fine. I cook this for 10 hours on low. Yes, that sees like a lot of time, but the meat gets so melt in your mouth tender from cooking that long. You could get away with just 9 hours if you had to. 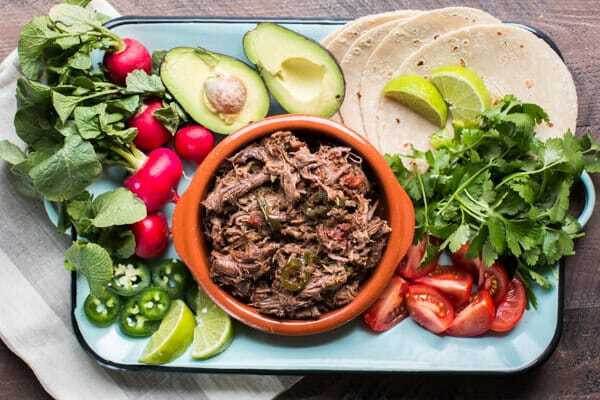 In fact this is the type of recipe that does good overnight because you can prepare your enchiladas or tamales during the day if that’s what you chose to make with this meat. When I made this I decided to go the easy route with dinner, and make soft tacos. 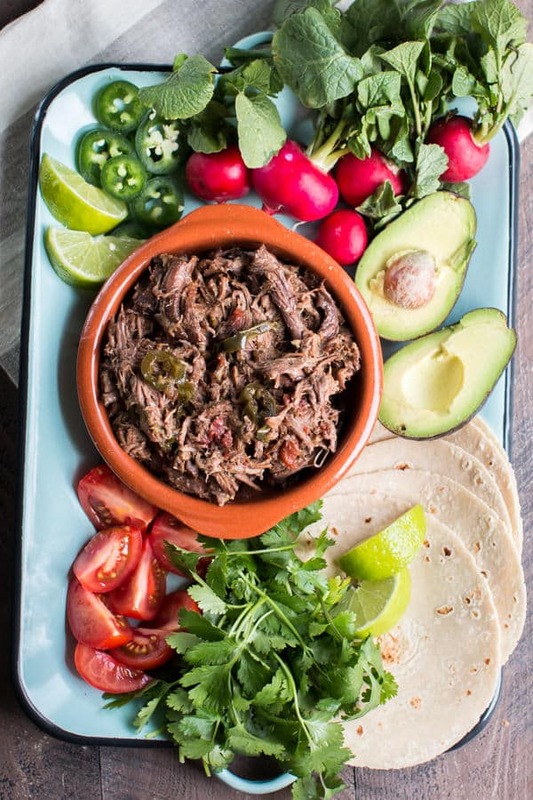 Whatever you decide to make, it will be good with the tender and flavorful beef. The next night I made red sauce enchiladas, all the hard work was done with the meat being cooked and shredded already. Below is my YouTube video of the making of this meal. You can follow me on YouTube here. In a large skillet set over medium-high heat on the stove top, add the cooking oil. When the cooking oil is hot, brown the chuck roast on all sides. 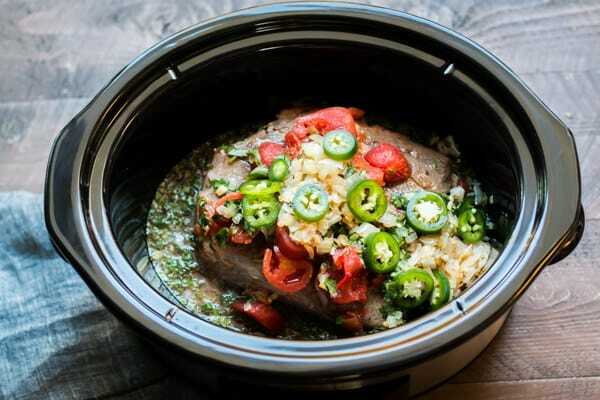 Add the chuck roast to the slow cooker. Add a little more oil to the pan and saute the onions until they are slightly brown, add them on top of the meat in the slow cooker. When the cooking time is done, remove the meat on to a plate and shred. Discard any fat. 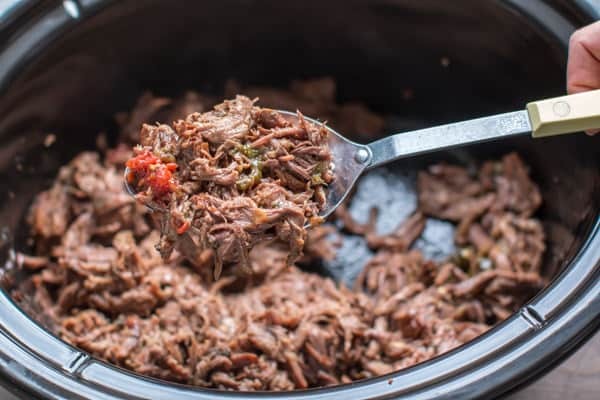 Remove the fat from the slow cooker, but leave about a cup of juices, add the meat in back into the slow cooker in the reserved juice. jalapenos is hot spicy chili from mexico ,right ??? Not really. Serrano and others are more notable Mexican peppers. How do you remove the fat when the juice is still hot? You let it sit for a minute after shredding. Lay a paper flat over the top and lift up, only the grease will lift up.